Management Information Systems | What is MIS? At the present, organizations realize that information is important as a property. It can add value to organizations. As well as, it helps organizations to survive among intensive competition. Therefore, organizations need information for management. Particularly, information must be a system to implementation for adding value of organizations. Each organization must manage information by systematically collecting. Then, there will be sending, receiving and analyzing information. Due to a lot of information in organizations, organizations use information technologies (IT) to manage information. Information technologies are applying science that is used for managing information. They are both hardware and software such as computers, cables, magnetic taps, CDs, monitors, operating systems, application software, signal and so on. Information technologies, particularly computer-base, systemize information in organizations. Therefore, users can quickly and easily adopt information. Information technologies can process data to be required information and sending/receiving information. with aiming to provide organizations’ information for operation, management and decision-making. These systems use computer hardware and software. Furthermore, Management Information Systems are used to collect and cumulate data from several sources both internal and external organization for processing and arranging information. Therefore, executives or users can apply it for making decision and other management. Computer systems are components of Management Information Systems. They involve the whole information systems of organizations. They facilitate organizations’ divisions with collecting, processing, showing, and sending/receiving information. These functions are used from an executive to an operational worker. As results, an organization sizes down, operates flexible, accuracy and fast. We can say an organization gets efficiency and effective. Nowadays, computer systems are main systems of MIS. Management Information Systems are integrated systems, so they’re large and complicated. To understand, there are divided Management Information Systems into 4 sub systems by purpose of use in each organization level.The organization levels comprises of operation, knowledge, management and strategy. Particularly, there are Management Information Systems support each level. Operational – Level Systems. In this level, there is transaction processing systems (TPS). They involve processing routine operation in organizations for decision support systems, management support system, knowledge work systems and office system. TPS are computerized systems that make performing tasks easier. Knowledge – Level Systems. These systems are used by knowledge workers such as scientists, engineers and clerks (they hold university degree.). Following these samples knowledge work systems (KWS) and office systems. KWS tasks are creating properly new information and knowledge by process. Then, knowledge worker can use it. Office systems perform document and communication. KWS and office systems process data from TPS. Management – Level Systems. 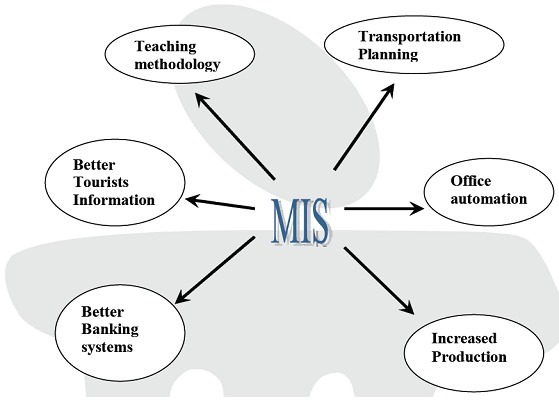 This level consists of management support systems (MSS) (many text book use MIS meaning MSS.) and decision support systems (DSS). These systems provide information for management functions like planning, controlling and decision making. MSS process data from TPS, then managers can use it. DSS help managers for making decision. They include models to evaluate situation and give possible choices. They process data from TPS and MSS. Strategic – Level Systems. Executives need internal and external data for planning strategy. So, executive information systems are created for them. ESS response executives’ queries. They process data from MSS and DSS. We can summarize Management Information Systems advantages of an organization following these. Users can quickly and timely access information since information is systematically stored by using computer systems and computer networks. MIS support executives making decision, setting and adjusting strategies and operational plans. They summarize and analyze information. So, executives can easily apply it. Good MIS will show how an operation accords to an organization goal. It’s adopted to monitor an operation. MIS reduce organizations’ cost because of time, labor and expenses reducing in long run.